Gorman-Rupp 10 Series® pumps are specifically designed for handling solids, corrosive liquids and slurries. They have few moving parts, so maintenance is minimal. If a clog occurs, it can be removed easily through the cover plate opening without the use of any special tools. The 10 Series offers a variety of seal configurations to choose from to handle a number of different liquids. Two-vane, semi-open, solids handling impeller handles up to 3" (76 mm) diameter solids, depending on pump model. Pump out vanes on impeller shroud reduce foreign material buildup behind impeller and reduce pressure on seal and bearings for extended pump life. Removable cover plate provides quick and easy access to pump interior without disconnecting piping. Clogs can be removed and pump returned to service in minutes. 10 Series pumps feature replaceable wearplates which fasten to the cover plate and can be removed for inspection or service. No expensive castings to replace. 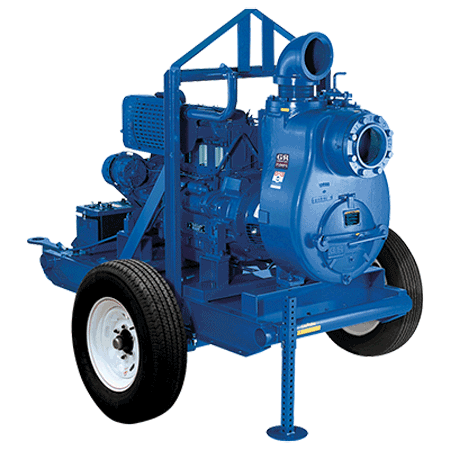 10 Series pumps are available as basic units for connection to customers' power source or may be flex-coupled or V-belt driven by an electric motor. Pumps can also be powered by gasoline or diesel engines.